I love what you've done to date even after you lost your co-blogger. 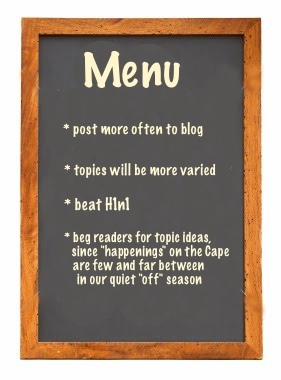 I think the canvas of the Cape affords you lots of opportunities. Be sure not to forget events in your blog. Sandwich Holly Days or Christmas by the Sea in Falmouth. Keep up the great work. I look forward to your posts. writingroads.com has a great blog about how to come up with things to write. We'd love your comments about this post! * Feel free to email us with any comments, suggestions, or just to say hello.